Designs are more sustainable if they are durable, functional, easy to care for and attractive. Tweed jackets, and other tweed garments, tick all these boxes plus the fabric and garments can be made by individual craftspeople using traditional skills along with small-scale, low-energy technology. Tweed’s history began centuries ago on the islands of the Scottish Outer Hebrides where islanders made fabric to battle the harsh winters. It was hand-woven by crofters using their own hand-spun wool. They called it Clò Mór in Gaelic which means ‘the big cloth’. By the end of the 18th century it had become an important cottage industry for the islanders as they started exporting cloth to the Scottish mainland. In time this tweed became a favoured fabric for shepherds and hunters. In the late 1800’s rich Victorians were buying up hunting estates in Scotland and they soon recognised the benefits of the clothes that their ghillies and shepherds were wearing. They started wearing tweed for their outdoor pursuits, like golf, so tweed became one of the earliest ‘performance’ fabrics. There have been many thousands of different patterns and colours of tweed manufactured over the years. There are also a huge variety of jacket designs, a very traditional one being the Norfolk Jacket, a favourite of Sherlock Holmes to go along with his tweed deerstalker hat. There are a plethora of more modern designs with modern cuts. Tweed is also used for suits, trousers, hats, ties and luggage. Coco Channel was introduced to tweed by her lover, the Duke of Westminster. She immediately realised the superior draping qualities of the twill weave as well as the functional beauty of the weaves. She designed jackets, as well as dresses and skirts, for women and brought the fabric to a massive new audience. Wool has many properties that make it an ideal resource for clothing fabrics. Wool is an excellent insulator and has one of the highest insulation to weight ratios of any type of fibre. Wool can keep 80% of it’s insulating ability even when it’s wet. Synthetic fleece, for example, is not this efficient and cotton has no insulating value at all when it’s wet. Wool fabrics are breathable meaning that moisture can evaporate through them. A merino wool fibre can be bent 20,000 times before breaking. By comparison, a cotton fibre will break after 3,000 times and silk after just 2,000. This means wool garments not only last longer, but also retain their appearance for a longer period. Tweed naturally repels dirt and stains. Wool fibers have a natural water wicking property that prevents moisture from being retained in the fabric. As well as keeping the body dry, this quality also naturally inhibits mildew. Wool also has natural anti-microbial properties because bacteria tend to be attracted to smooth positively charged surfaces like those of synthetic fibres rather than the scaly, neutrally charged surface of wool fibres. In addition, the outer layer of wool fibers have a high concentration of fatty acids, which have anti-bacterial properties. Unlike synthetic fabrics, wool does not retain odors and will freshen just from airing out. The water resistance of wool allows time for a liquid spill to be wiped from the fabric before it can cause permanent staining. Even if they are not wiped before drying, wool is less prone to stain than many other fabrics. Wool does not gather dirt as much as most other fibres. 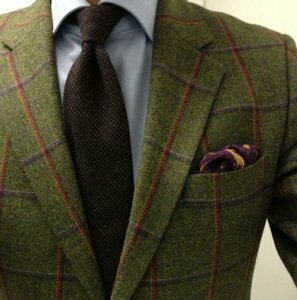 The method for cleaning a tweed jacket is to simply brush it. This is effective because of the ability of wool to easily release dirt. Wool does not catch fire easily, when subjected to flame or a burning spark wool will most likely just smoulder and extinguish itself. Synthetic fabrics can catch fire easily and as they burn they melt. A spark from a fire may not even put a hole in a tweed jacket whereas it definitely will put a hole in a synthetic fleece one. Also, the tweed weave is flexible enough that a sharp object, like a thorn, can pierce the fabric but not leave a hole. Wool is an organic material – renewable and biodegradable. There is a good argument that sheep (and beef) are not a sustainable resource for food or materials. Sheep and beef are enteric animals meaning that they release methane, a potent greenhouse gas, as a by-product of their digestive process. 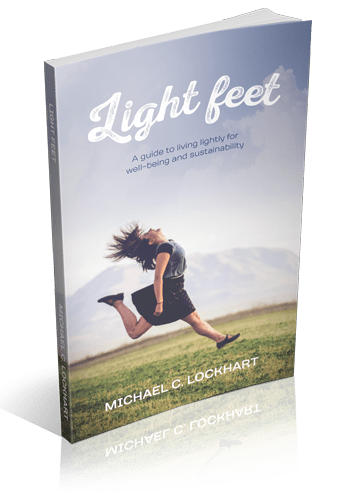 On the other side of the ledger is the fact that wool and other natural fibres use much less energy (and therefore have less emissions) in their production than synthetic fibres. Wool, because it is an organic material, sequesters carbon, like wood does. Provided the wool is grown, and wool fabrics are produced, in the most sustainable way they are an excellent choice. Tweed is still produced on handlooms by individual craftspeople in the Outer Hebrides of Scotland. In the early days if was an important source of additional cash income for crofters and fishermen. Tweed is also manufactured on a large scale in factories with motorised looms, although there is still the need for a number of skilled staff to set up and monitor the looms. In a similar sense, the jackets themselves can be mass-produced, but the best ones are hand-tailored by talented craftpeople. Watch the video below to see a craftsman weaving tweed on a foot-powered, wooden handloom.